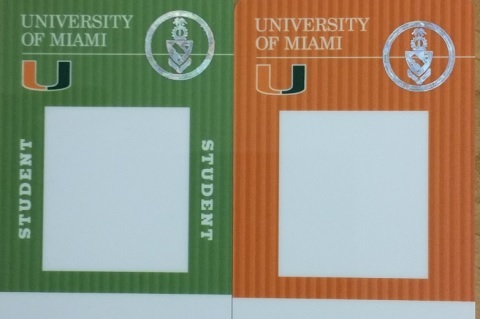 The Cane Card is the official on-campus identification card of the University of Miami. The university requires that all students, faculty, staff as well as other members of our community, are required to carry their Cane Card for identification purposes while on campus. You can obtain your Cane Card in person, at the McKnight Building, 1st floor, 5807 Ponce De Leon Blvd. A valid photo I.D. will be required to obtain a Cane Card. Access the Cane Card Photograph Requirements here. There is no charge for your first card but a $25 fee will be assessed to replace your card and cash is NOT accepted. For safety of you and others, we encourage you to report lost or stolen Cane Cards promptly. Hours of operation are Monday-Friday, 8:30 AM - 5:00 PM. New students: More detailed information will be e-mailed to all new students about dedicated orientation sessions when the Cane Card can be collected. Current students: You are required to carry your Cane Card at all times while on campus. Lost or stolen cards should be reported to the ID office at 305-284-3096 or to Security 24 hours a day, 7 days a week by calling 305-284-6666. The card will be immediately deactivated. Students can also deactivate their card online via Canelink. A $25 fee will be assessed for replacement of lost or stolen cards. Damaged cards will be replaced free of charge upon exchange of the original broken or non-working card. Faculty and Staff: Prior to issuance of a Cane Card, all valid approvals must be submitted by the authorized personnel and departments including Faculty Affairs for Faculty and HR for Staff. Approvals should indicate the level of access being granted. You are required to carry your Cane Card at all times while on campus. Lost or stolen cards should be reported to the ID office at 305-284-3096 or to Security 24 hours a day, 7 days a week by calling 305-284-6666. The card will be immediately deactivated. Faculty and Staff Dependents: In order to receive a Cane Card, a University of Miami ID number (C-number) is required. Visit the online CaneID Registration and complete the registration process. The employee with dependent will need to forward to HR Benefits a copy of the supporting paperwork such as a birth certificate or marriage certificate (please call HR Benefits at 305-284-3004 for details). HR Benefits will authorize the dependent to be added to the Cane Card system. Additionally, the following Cane Card form must be completed and signed by authorized personnel in order to be granted a Cane Card. There is a $25 fee for the Cane Card for non-UM personnel. Vendors, Contractors, and UM Affiliates: In order to receive a Cane Card, you need a University of Miami ID number (C-number). To obtain a Miami ID visit the online CaneID Registration and complete the registration process. The department liaison or sponsor must then click here and complete the online request form. The following Cane Card form must be completed and signed by authorized personnel in order to be granted a Cane Card. A Cane Card fee of $25 will be assessed for non-UM personnel. Learn if you are classified as a UM Affiliate. If the department is paying the fee, an email should be sent to parking.gables@miami.edu specifying the name of the vendor that the department is paying for an the account number to be charged. Once the card is issued, the fee will be processed to the department via journal entry. Access Control, a unit of Facilities Management, works with the UM Police (UMPD) by granting access via our electronic access control systems. To request building access services, please contact your department supervisor. Access information related to Access Control through here. How do I take care of my Cane Card?